CruiseJobFinder interviewed an executive with Cruise Alternatives CC, a recruitment specialist for Carnival Cruise Lines, Carnival Corporation Casino Division, Oceania Cruises, Regent Seven Seas Cruises, and others. In this interview he describes what they do for clients and how to improve your chances of getting hired. The company accepts applications and CVs; perform background checks on applicants; conduct the screening, initial and final interviews; help the successful applicants with getting visas and other documents; assist with medical instructions and more. Cruise Alternatives CC aims to help with every aspect of the hiring process up until the person boards the cruise ship. Photography, hotel staff and housekeeping, galley and kitchen staff, casino division staff and other roles. Obviously, it is more difficult to hire the senior roles, where there are less applicants that are qualified, but we are also always on the look-out for youth counselors, waiters and bar staff, photographers, and kitchen staff. Kitchen staff and being a waiter are not the most "glamorous" of cruise jobs, and most people try to apply for something more interesting and that possibly pays a bit more. The perfect candidate would be someone who is outgoing and friendly, with the ability to also work hard and be reliable. Cruise lines are looking for people who they can trust to provide a great experience for their passengers in every area of the ship, so you must always be well spoken, well presented, and have a great attitude. Aside from that, you will have to show that you are experienced and proficient in the industry/department you are applying for a job in. Are there any common traits people should have in order to get hired? You need to be over the age of 21 and preferably have some sort of diploma or qualification for most of the positions on board. You will also need to have excellent English speaking skills and be medically fit and healthy, as you will be at sea for an extended time, working every day. Most jobs also require you to have at least 2 years of experience to be accepted. Each contract ranges from 4 months to 9 months depending on the job, and usually once you have completed your first contract, you can be sent back to the same ship in a more senior position. This is how you can become a manager. Well this depends largely on when they get their CV in to us. If it is during our main recruitment times, it can take about a week or two to get hold of everyone. And then the final interview could take place anywhere within a month or two. It all depends on when the representatives visit South Africa, as this is where our final interviews take place. What are some common misperceptions people have about jobs on cruise ships? 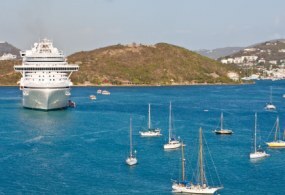 We find that the main misconception is that people think of cruise work as a "working holiday." It should rather be viewed as a professional employment opportunity, and yes, while you will visit exciting destinations around the world, you will not get to enjoy them as a holiday maker. Perceptions about processing, expenses involved, and the timeframes are also misconstrued. Another very big thing that people do not seem to understand is that we do not guarantee placement for siblings or friends on the same cruise line. Just because you apply together, or interview together, does not mean you will work together on the same ship or even at the same time.